Every trucker knows not every state is the same when it comes to driving. Some are relatively easy to drive through, while others will have you screaming and slamming your steering wheel in frustration. Whether the problem is distracted driving or people being reckless with their speed, certain states are actually considered more dangerous to drive in. We’re breaking down the top 5 most dangerous states on the road. Coming in at number 5, we have the cowboy state. Leading the country in both speeding and drunk driving fatalities per capita, it’s quite surprising that Wyoming ranks this low. However, due to the availability of jobs and the average salary in Wyoming, it’s considered a desirable place for truckers. Just be extra careful when you’re on the road because there’s no guarantee that other drivers will be doing the same. Next, we have the state of Mississippi. Having the fourth most driving related fatalities per capita is something no state wants to be known for, and there seem to be several reasons it finds itself there. To start, like many states that struggle with driving fatalities, there may be a drunk driving problem. Mississippi finds itself in the top five states in drunk driving related deaths. But there also seems to be an issue with infrastructure of Mississippi roads. According to CNBC.com, over half of Mississippi roads are labeled mediocre to poor condition. Drive cautiously when bad weather strikes as there is no promise these roads will hold up. Located just above Wyoming, Montana appears to have the same bad driving habits as its neighbor. Facing scrutiny, in 2017, the state compiled a report based on 2015 data to identify the leading problems of driving fatalities. The results may be exactly what you suspect: driver behavior, road and weather conditions, and laws governing drivers. It will be interesting to see what action Montana takes to make its roads safer. New Mexico ranks in the top five among speeding, drunk driving, and distracted driving fatalities per capita in the United States. The combination of these three categories is the reason it finds itself as the second most dangerous state to drive in on this list. New Mexico has a long history with alcohol related deaths. Hopefully in the coming years, we will see those numbers start to decline, but for now, just make sure to be aware of other drivers. North Dakota has the most fatalities per 1000 drivers (.256) in the country. After a decade of rising drunk driving statistics, numbers reached an all time high in 2016. Mixed with unsafe speeding habits, North Dakota drivers experienced serious driving troubles. Acknowledging the problem, state troopers have reassured that they will up their patrol and focus efforts on crash related behaviors. These five states are among the most dangerous in the country when it comes to driving. Finding where the issue lies is the next step in making our roads safer. You may have noticed a common theme of drunk driving and speeding and maybe that is where we start. For now, we tell our truckers to take care and be aware of their surroundings. 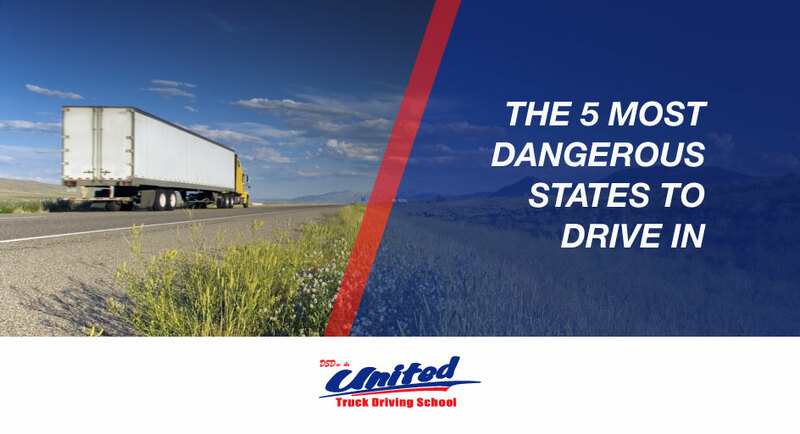 United Truck Driving School, Inc.
United Truck Driving School is authorized for operation as a postsecondary education institution by the by the Tennessee Higher Education Commission. In order to view detailed job placement and graduation information on the programs offered by United Truck Driving School, please visit www.tn.gov/thec/ and click on the Authorized Institutions Data button.